Forum Index > Off-topic Talk > Armed musicians. 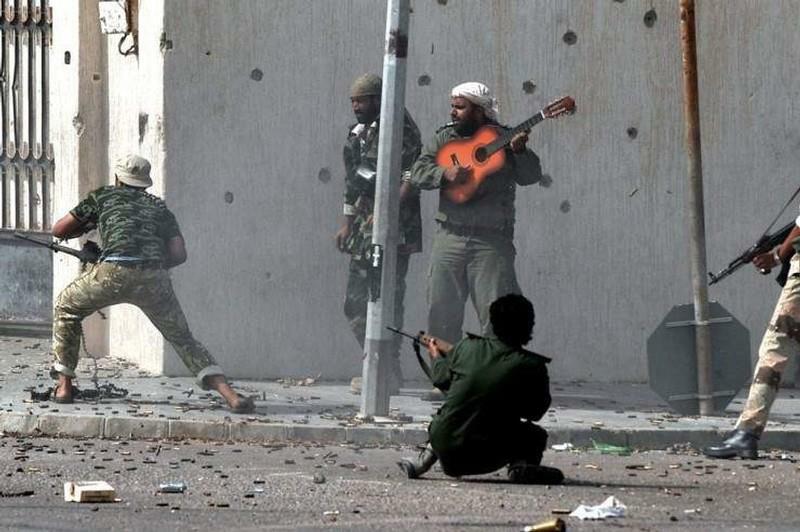 Posted: Sun 05 Aug, 2012 12:52 pm Post subject: Armed musicians. Hi, mine is a simple question. Is there any proof that the musicians that went to battle (drummers, trumpeters, etc...) in the medieval period (1200-1400) were actrually armed? Like having a falchion and a buckler or something similar? Interesting question, and I don't really know, but unless there was a rule or tradition against musicians being armed I would think they would carry something ? At least a dagger and maybe a big one ? If there was a logical reason to not be armed it would be a rule or local tradition of " Don't kill the unarmed drummer boy ", but I have never heard of such a rule. ( This, if true, might vary greatly from culture to culture and the standard rules of war in time periods where there where some generally accepted rules of war ). Maybe when we get to the XVIII century and armies had uniforms and strict regulations about just about everything from number of buttons on a coat to the regulation length of mustaches or even if one could have facial hair it may be plausible that the musicians would not be armed their duty being strictly limited to helping in communicating orders in the field, and helping to keep marching troops in step and good order. At the point where the musicians would have to draw a weapon things would have gone very badly and be very desperate. Period painting of battle, show military musicians of the XVIII century ( Napoleonic troops maybe ) wearing a belted hanger or small sword. I'm only using these later periods to illustrate the possibilities and sources that might inform on later traditions: It doesn't really help for the period you are inquiring about. As far as I know, traveling musicians, artists, circus folk and similar people were generally not allowed to defend themselves. Whether deservedly or not, such people had quite a bad reputation as thieves, troublemakers and so on. So it makes sense to be more strict with the rules for bearing arms for such people. Similar to Gypsies perhaps. This of course does not apply to troubadours of noble birth. Whether the type of musicians that accompanied armies were of the same class as traveling circus folk is another question. I would assume that musicians who provided entertainment for the troops were generally not the same as those who gave signals in battle. It's actually not quite as simple a question as you might believe. 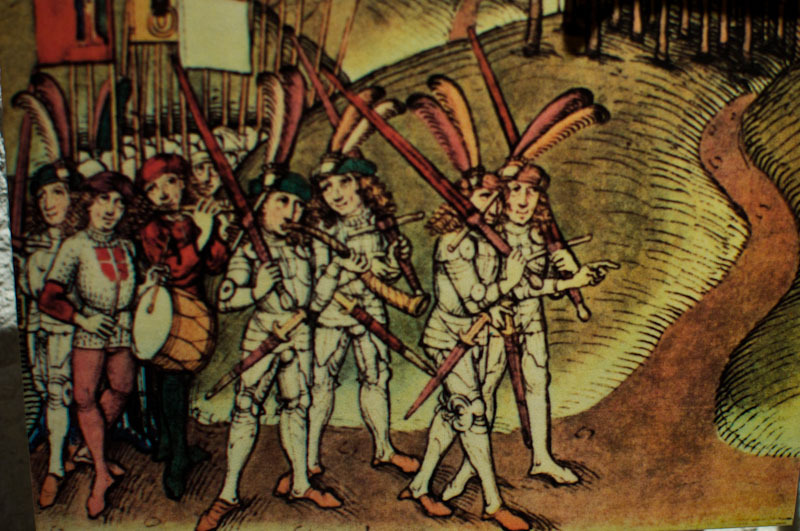 At certain points in history, there was a distinction between household musicians (those who provided entertainment and could include winds, keyboards, strings, and smaller percussion instruments) and the musicians associated with the noble's war machine: trumpeters and drummers hired not by the household administration, but by that associated with the stables. In looking at some period art, household musicians in civilian settings seemed to be armed with the same frequency as the civilians around them: not very much if at all. You'll find some period art that shows musicians armoured (11 Joys of Marriage, ca. 1485 among others). The Maciejowksi Bible (aka Morgan Bible, etc.) shows a few images of trumpeters with arms and/or armour. In one image, the unarmoured trumpeter plays his trumpet with his right hand and holds a dagger in his left. In a couple of others, fully armed and armoured trumpeters appear with swords scabbarded at their belts. But there are also plenty of images in other manuscripts of civilian-dressed, unarmed musicians in battle scenes. Hunting images (like the Hunting Book of Gaston Phebus) show people with knives, swords, and hunting horns. But I don't know if these would be called musicians or just hunters with a signaling device. It's tough to say with certainty. To begin with, a lot of period art was commissioned with an agenda in mind: to curry favor a noble, commemorate an event, propaganda, etc. Accurately depicting musicians, who were non-noble and usually not pivotal to the event being depicted, may not have been high on the artists' list of things to do correctly. And that assumes the artist had firsthand knowledge of the event to begin with, which is unlikely. My guess (and that's all this is) is that most who accompanied soldiers in battle would have at least had some way to defend themselves. As a non-noble battle participant (you weren't neutral like the heralds), you could expect to be attacked. As a non-noble, your hope for capture was likely slim. As a signaler, you would probably have been a target, since your death means no more trumpet calls to convey information and morale to the troops. The metal in your instrument had some value, which could also make you a target. If you had your lord's flag hanging from your trumpet, it would be a nice souvenir for your opponents. There would seem to be a need for self-defense of some sort. But I don't know anything concrete about how they did that. I would assume you had what your status allowed you to afford. In neither picture can we see the drummer being armed, however the texture of his shirt would hint to it being mado of mail, especially after looking through some other works of Diebold Schilling, who I suppose is the artist behind these pictures. Both pictures show one of the plate-clad greatsword carrying men having some kind of horn, but given that they are carrying greatswords I wouldn't call them musicians. Yet the drummers are not carrying the basler/degen that even the greatswordsmen have as backups. 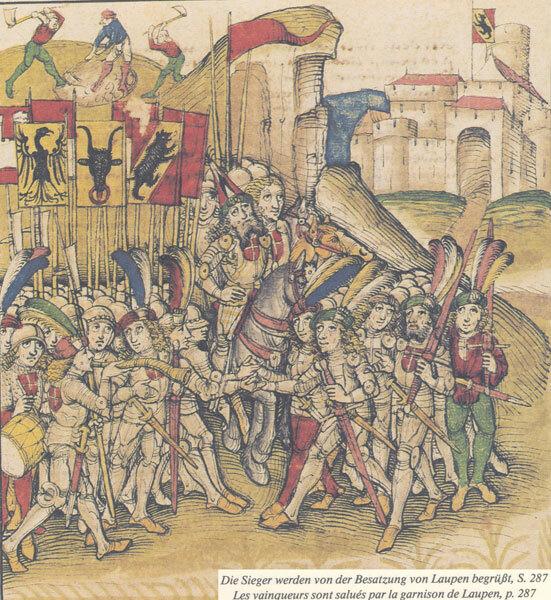 One of the pictures has a caption, the victors being saluted by the garrison of Laupen. this would imply that the battle is over and perhaps a soldier hadn't used the horn during the battle. 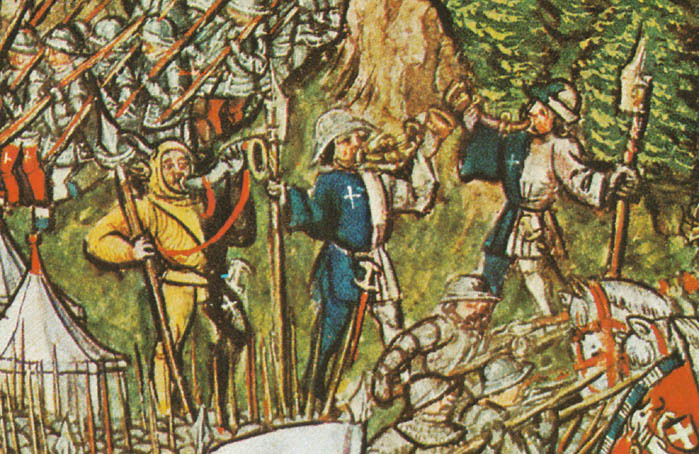 In his illustration of the battle of Grandson we can spot three armed horn-blowing men, again atleast the one on the right side carrying a voulge, the other two seem to have spears. These musicians are high in the middle of the left page. Here at the low right corner we can see a mounted armoured person with what could be a pipe or horn of some kind. Again, a sword hilt could be covered by the horse. I certainly have to get more aquinted with Schillings illustrations, but after getting some sleep. I need to go through all available material some time later to get a clearer picture. While searching for decorated scabbards, I came across this image to add to the thread. For me it would be common sense to carry a quarterstaff and a knife as a musician.They both hit the bottom line of definitions of being armed and are as light and cheap as possible. Musicians and standards are communication items of an army, so I would expect all the armed guys to be indoctrinated to defend both of them at all costs on close quarters combat. The horns might differ from the drum because while the drums give a constant signal for organization, the horns are a signal for specific commands like attack in the depicted Swiss armies above. Thus the musicians can have a different standing according to the role of their communication. No matter how they are defined, that pretty much doesn't help under indiscriminate missile fire, so some kind of protection is required for all of them. The same dress appears consistently worn by hornblowers related with the canton of Uri. I've understood that the hornblowers dressed so to imitate the heraldry of the canton. Jesters on a battlefield are something completely unknown to me so I could be wrong... Also as seen earlier in this thread a "musician" can be interpreted in a variety of ways. I was speaking of the Story of Taillifer, bard/jester of William the Conqueror. Supposedly he was the first Norman casualty of the Battle of Hastings. He supposedly rode out singing the Song of Roland and juggling his sword. A Saxon challenged him, Taillefer cuts him down, and then is encircled by the Saxons and cut down himself. He is referred to by many period commentators as an Ioglere, which we would call a Juggler. He was a full armed and equipped Miles, so its not a jester in the latter medieval sense. More like a noble bard. thanks for straightening that one out Guess I just misunderstood what you were referring to. Speaking of which, Roland was a horn-blower himself. While this is a semi-fictional work based upon Battle of Roncevaux Pass, it still probably was written according to customs of the day. Roland was a warrior for certain it would seem, and one that was a musician in the terms of a signaller. Wolfram was not strictly a musician, but a sort of bard, warrior. Several poet laureates referred to his works as sources of inspiration within the past century or so. He had a reputation for reciting epics of 20,000 lines or so from memory, entertaining for a whole day with song and stories. I don't know of any of the music that he played having been written down though. Why do they need to be armed if their music already gives a +2 morale bonus to attack rolls and Will saves for the warriors around them? That is a funny pic. Is that actual or is the guitar added in somehow? In reviewing various sixteenth-century military manuals such as Smythe and Fourquevaux, I haven't seen any mention of drummers/trumpeters carrying weapons or fighting. These manuals talk at length about the technical details of musical commands and where to position musicians in the field. They also recommend that musicians be skillful negotiators/orators. Smythe even noted the weapons he wanted for wagoners/laborers/porters/etc and when they should fight, so the this absence is curious. Found a source for (lightly) armed drummers. Yay!